At the end of March my brother and I took a couple extra days off from work to head down to Death Valley for a shakedown, or practice, trip. Driving 3 hours south took us from the snowy peaks of the Sierras to one of the most intense deserts in the world. We chose to do a shakedown hike in Death Valley to prepare for the hot and dry sections of New Mexico along the first section of the CDT. 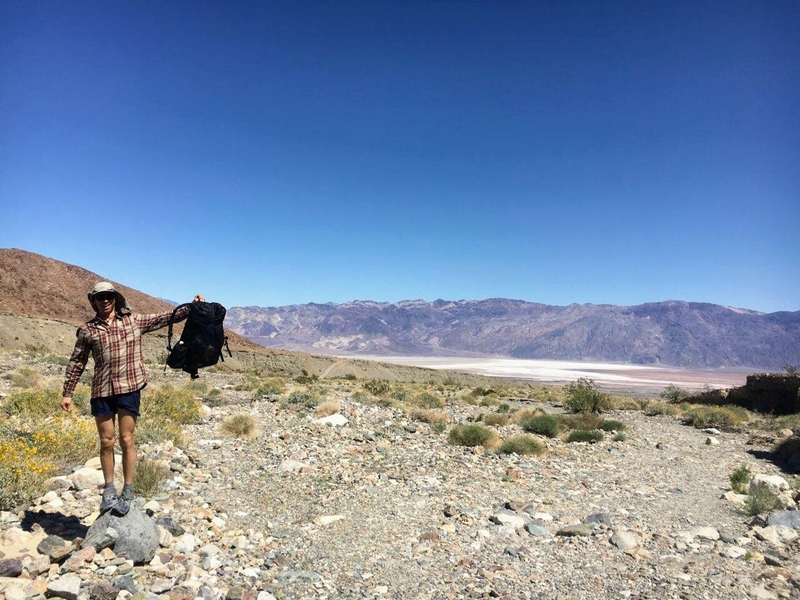 Before my PCT thru hike I did a similar shakedown hike in Death Valley to prepare and I feel it helped to boost my confidence for the first section of that trail. 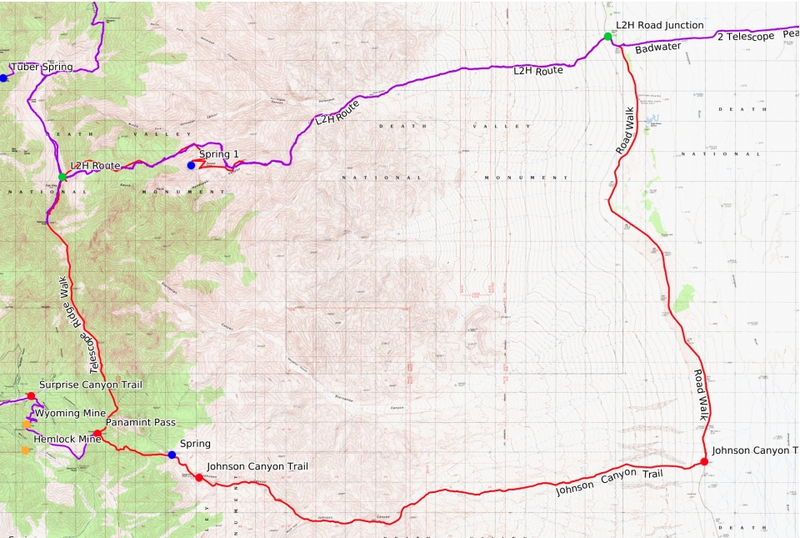 We had mapped out about a 45 mile loop starting from the west side of Badwater Basin. The route then climbed a little over 11,000 ft via Hanaupah Canyon to the Panamint Range ridge line and summiting Telescope Peak. This section coincided with the Lowest to Highest Route, a route that travel from Badwater Basin to Mt Whitney. 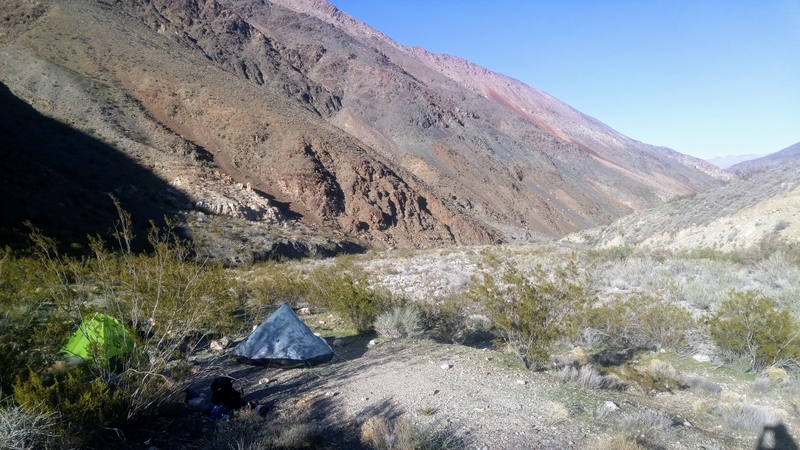 Then we planned to ridge walk south to Panamint Pass where we would then descend through Johnson Canyon and back to our car. We did roughly 12 miles from a gravel parking lot along the western edge of Badwater Basin. Our day started with a climb miles up the alluvial fan to the mouth of Hanaupah Canyon. We followed a 4×4 path for a while until the creek bed ate it up and it vanished. Around the corner we found a flowing creek that would provide us each with 4 liters of water each for the next stretch. With hours of daylight left we decided to go further. Our next leg would involve climbing about 4,000 feet in less than a mile. Yes it was straight up. We found a beautiful spot to camp on the ridge line. Hopefully we will be protected from the wind. There was not a single cloud in the sky. Got some sunshine today, the warmth felt familiar. We woke up to the sunrise in the morning. I slept well, stayed warm, apparently Brian struggled with warmth. The whole climb lay before us. We could see every little incline from where we were standing. So we headed up hill. The climb was 5,000 ft of crazy. Straight up hill. It got colder with every foot. At about 8,050 we started to see little spots of snow. Here we took a snack break before the final push to the ridge line where an actual trail sat at 9,800. Hopefully this trail would lead us to the summit of Telescope Peak. Climbing continued after our mountainside brunch. After another 1000 feet of vert gained the snow became prominent. Thankfully my brand new Altras provided me with adequate traction on the slippery surface. It was at this point it started to feel like winter up there. Cold winds tried to blow us off the ridge line we followed. There were points when I sought shelter behind rocks. 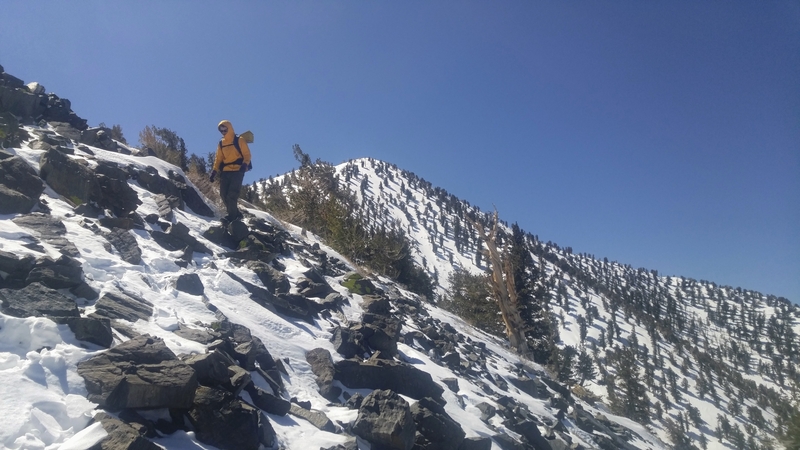 With a little persistence we gained the Panamint Range ridge line. Bennett and Rodger peaks lay to our right and Telescope Peak sat to our left. The Sierras came into view in the distance to the west. The Badwater Basin lay 10,000 feet below us to the east, our starting point. Telescope Peak sitting just behind Brian. The summit approach did not look appetizing. It would have been convenient to have brought microspikes and ice axes to ensure the way. However, I left mine in the car, because my brother didn’t have similar equipment so it seemed silly for me to be the only one carrying that gear. We decided to turn around shy of the summit and head back down without trying to continue with our original loop route. From there we headed all that way back down to the canyon floor, retracing our steps. For how exhausting the uphill was, the downhill was comparable. We spent night number two near the Hanaupah Spring. We erected our tents on a lovely little flat spot of ground and enjoyed a good night’s rest. The sun woke us up a little later than usual so we were able to get a little more rest after our strenuous route the day before. Once packed and ready we headed out of the canyon, back towards Badwater Basin. This time we decided not to follow the same 4×4 road and instead took a cross country route following a gravel wash back to the car. It was a welcome change from following at 4×4 road. Several hours later we made it back to the car, all in one piece and spirits high. We then had veggie burgers and cold beers as our next priority as we headed back towards civilization. My pack felt great! At one point it was carrying two and a half days worth of food and 4 liters of water. It carried that weight well and I was pleased. This hike helped me figure out how to pack it and organize the thing. I am now even more excited to carry this pack for over 2,000 miles. Not a bad cowboy camp. 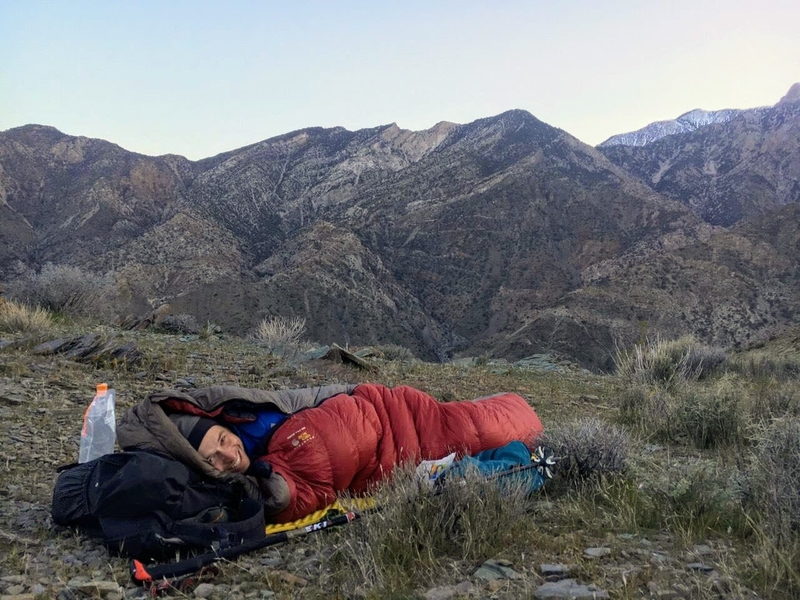 For three nights I slept on a foam mattress, the fabled Thermarest Z-Lite. I was surprised with the quality of sleep I got. For all of my thru hikes I’ve carried air mattresses. I shied away from carrying my air mattress after my brother put a hole in his at the beginning of the trip. The foam pad is so convenient! I might be reconsidering my sleeping mattress situation. I set up my tent just once on this trip, instead we opted for the cowboy camp. Thankfully, I am starting to figure out how to pitch my Hexamid Solo properly. Practice makes perfect. A taunt pitch is highly necessary and provides the tent more of a structural resilience. My brother’s Nemo Hornet and my Hexamid set up in Hanaupah Canyon. After my brother and I settled into bed on night two a wind came down the canyon and blew through our campsite for a minute or two. There we points when I considered taking down my tent and folding it up to ensure it wouldn’t get damaged or blown away. I was pleased when it held out and only one stake was pulled out during the strong gusts. The wind eventually died and I was able to stake the tent out again to prepare for more wind if it were to come back. The rest of the night remained calm and I enjoy sleeping in my tent. About half of this hike was off trail. When planning this trip I felt it would be good preparation for the CDT for us to get off trail and do some route finding. It not something that I expect to do too much of on this trail, but I know there will be a little routing finding to do. It was great practice and I enjoyed the adventure of it and guiding ourselves up the mountain. This is something I would like to do more of in the future. During the crux of the route we had to make a decision on whether or not to continue our planned route. Decision making is a crucial part of thru hiking. If you don’t make a correct decisions along the way you could be putting the success of your thru hike and your safety at risk. From what we saw while we were standing below Telescope Peak that route did not seems safe. We also had doubts about the route continuing past Telescope Peak. I was doubtful that people had recently continued past the peak along the ridge line. This meant that we would be blazing a route though the snow without additional traction and axes for backup. While making decisions you have to separate yourself from the circumstances and provide yourself with a chance to look at the position from a neutral view. We both were able to look at the situation and make a educated decision without suffering from summit fever. Lastly, and most importantly, my body felt great! Climbing and descending 10,000 feet is quite a lot, and not something that I am expecting the CDT to reciprocate. Of course my legs were a little sore the days after the hike, but that’s something I am expecting on trail anyways. Me with my Waymark Gear 40L pack, Badwater in the background. This shakedown hike has gotten me more excited and even more ready to start the CDT. I have ten days left here in Mammoth. In the coming time I am going to purge my possessions and pack things up. Once we leave Mammoth we will be traveling around for a couple weeks which will provide a distraction until we head to New Mexico.